Are we ready to use our mobiles to buy goods? Can phones really replace the credit card? 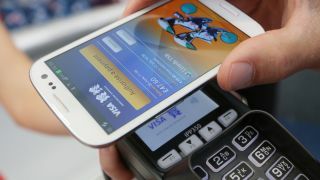 TechRadar was invited to take part in Visa's Olympic phone trial to see whether the UK is ready to ditch cash in favour of paying using phones - but is the country ready yet? We joined 800 others – including Olympic athletes – in using the official Olympics phone from Visa: a Samsung Galaxy S3 equipped with a dedicated payment app for three months, with £50 of credit to try out in the Olympic Village and other contactless-enabled outlets. For those still in dark about contactless payments, it's a system that uses Near Field Communication (NFC) chips in cards to pay for goods, typically under the value of £20. These chips are increasingly being pushed into phones too, so you could use your latest smartphone to pay for your coffee, morning newspaper or jaunt to McDonald's – mostly the places where you would traditionally use cash. The Visa Olympic phone was set to up to work anywhere that has contactless payment enabled: this is often denoted by a sideways Wi-Fi-like icon (sometimes with what looks like someone sticking a stamp on), or simply the word 'contactless' on some terminals. "Over the last four or five years we've been getting the infrastructure in place in the UK where consumers can pay by contactless card. And what we're putting in place for phones is future-proofing for phones," Mary Carol Harris, VP of innovation and new product and channel development for Visa, explained to us. "In the UK today we have 140,000 merchant locations for contactless. We're starting to see a mass issuance of [contactless-enabled] cards, and this method of payment is extremely instrumental in paving the way for mobile, as it helps consumers trust the technology and integrate it into their daily lives." However Visa has set a startlingly high prediction that in just over seven years 50% of all its transactions will be with a mobile device – so we headed out into the depths of the city to see how well we could live by only paying with a phone. However, while we're starting to see contactless-enabled credit or debit cards being used in real life, we wanted to see if it was as easy to pay for goods using a phone – and whether it was enough to trigger a mindset change from those used to paying by card or cash. Before we head to the shops, let's take a look at the mechanism that facilitates these payments: the dedicated Visa Olympic app which gives you the access to your cash on your phone. It's a trial app that doesn't allow full functionality as yet: it's heavily Olympics-branded, and only allows pre-paid credit to be added to the phone. We had to jump through a number of hoops to sign up, including ID verification and card association. This isn't abnormal though, and while the set up was slightly laborious, it at least gave a sense of security. It also made topping up easy: our debit card was linked to the app so we only had to request funds and enter an 8-digit PIN to gain access. "There's a mobility factor with contactless technology on phones. If you leave your house in the morning and forgot you phone, you'll go back for it as many can't live without it. Nowadays you can almost get by without your wallet, but the phone has become integral to your daily life," she added.